Concrete overlays are an excellent way of transforming the overall appearance of your concrete walkways, pool decking, countertops, floors, and many more. Even though you can install some of these surfaces by yourself, it’s always good to leave it to professional contractors if you want the best results. The most important part is to buy high-quality products if you’re going to record astonishing results. You also have to make sure that you are choosing a highly skilled contractor to implement this task. Sure Spray: These are thin and self-bonding concrete overlays that are perfect for pool decks, walkways, driveways, and patios. Sure Tex- These are commercial grade concrete overlays that have a textured slip resistance. Sure Stamp- It is used in resurfacing the interior and exterior concrete surfaces with a stamped concrete look. Sure Broom: Represents commercial grade for retexturing and leveling both the interior and exterior surfaces that are mostly broomed for the achievement of a non-slip surface structure. Concrete overlayment has several advantages. You can overlay to correct concrete floors that have damaged areas or uneven surfaces. Concrete overlays deliver durable, string, and smooth surfaces that come with decorative color treatment. Concrete overlays are manufactured from polymer-modified cement and are designed to remain bonded and last for the whole lifetime of the concrete. When levelling or smoothening worn or uneven concrete surfaces, you may desire to pre-patch the concrete and get it as smooth and even as possible before you apply the final overlay material. Self-leveling overlays can be an excellent choice if you desire to get a level and smooth surface. These concrete overlays are designed to pursue their own smooth and level with a simple touch of a gauge or rake tool. You can decoratively color each concrete overlay using stains and dyes to enhance its overall aesthetics. To get a more elaborate thing like saw cutting, stenciling, or engraving, you can decide to augment the element of the decorative concrete further. The other option is adding decorative inlays like wood or metal that adhere to the base of the concrete. The next step is to pour the concrete outlay to the inlay level. Palm Beach Concrete Underlayment Services can help you to get the best concrete overlays. You will always find cracked and unattractive concrete patios, steps and walkways everywhere. However, some of the steps that you think should be removed can end up being resurfaced with the use of decorative concrete overlays that look to be new. A fairly low construction and simple process with the right processes and materials will significantly enhance the appearance of the surface. 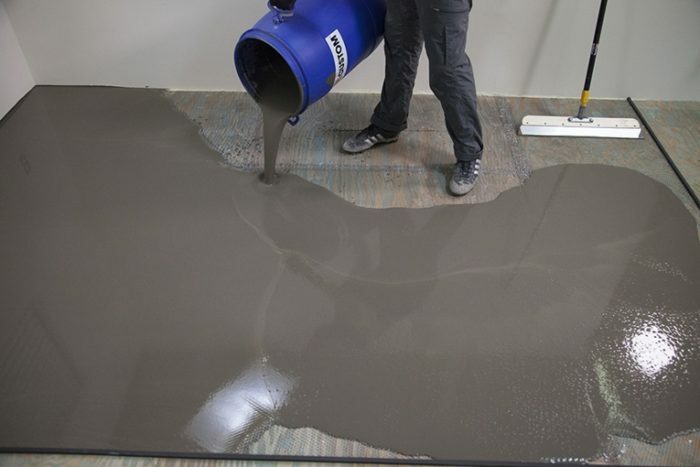 Concrete contractors can use epoxy filler and sand to fill all the cracks for increased durability. These professionals will also use hydrolic cement that dries fast for crumbling or spalling concrete or use a patching product while adding the polymer hardener to enhance strength. After replacing the concrete surfaces, you can mix the concrete overlay with any color and then apply to the concrete. These experts can use the Magic Trowel to smoothen the overlay. Other systems use steel trowels to burnish and smooth the surface. Contractors can also stamp the overlays in several brick or stone patterns. The coating’s thickness range from 1/8 to 3/8 inch thick. There are various factors that determine the thickness of the overlay such as doorways, vents, and adjacent flooring. The adaptability of the thickness of the coating offers a solution when the element of height becomes a code issue. Adding a thin layer in most cases enables code compliance with an added benefit of decorative and durable surfaces. The other advantage of concrete overlays is that they have unlimited color choices. You can mix the colors in the concrete and then topically add to concrete dyes and stains. Acid stains can hold up to UV rays but dyes cannot. The most popular and easiest color solution is the integrally colored concrete. Resurfacing stairs and steps are very popular in walkways, patios, and decks. Concrete overlayment adds a lot of value to your property. Most commercia and residential buildings apply these surfaces to their interiors and exteriors spaces to add value to them. The possibilities are endless and modern improvements in technology enable long term performance. Concrete overlays are faster and a less expensive option than tiles of reinstalling new concrete.